Jojoba Desert, the leading global producer of jojoba oil, held its first seminar in China on Tuesday, August 15, at the Hilton Guangzhou Baiyun Hotel. The seminar was co-hosted by Guangzhou Limeida Import and Export Ltd., Jojoba Desert’s partner and distributor in southern China. 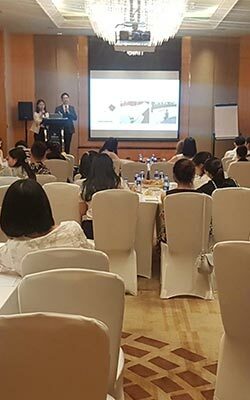 Representatives from 40 leading cosmetic brands and manufacturers in south China – including R&D, purchasing and marketing managers – attended the seminar, which highlighted the unique benefits of jojoba oil as a natural ingredient in cosmetic formulations. The seminar featured two keynote speakers from South Korea. Dr. Kim Ji Soo, Director of the Dr. Youth Anti-Aging & Aesthetic Clinic and CTO of Dr. Youth Cosmetics, presented in-depth scientific evidence regarding jojoba oil’s special properties. He also explained how the raw material can be incorporated in various cosmetic formulations. Mi Sun Kim, General Director of the Korean Association of Essential Oils, Aromatherapy & SPA, demonstrated how jojoba oil can be used in aromatherapy. Ms. Maya Asher, the Vice Consul of the Economic and Trade Mission to South China of the Consulate General of Israel, Guangzhou, delivered the event’s opening remarks. She emphasized the great cooperation and growing trade relations between Chinese and Israeli companies, and praised Jojoba Desert’s achievements in gaining a significant share of the market in Guangzhou and throughout China within such a short time. The event was quite enlightening for the attendees, many of whom expressed great interest in the potential for using jojoba oil. We would like to express our gratitude to all of those involved in making the seminar such a great success. A special thanks to our keynote speakers, the Consulate General of Israel, Guangzhou Limeida, and all of those who attended. Given the seminar’s success, we look forward to hosting similar events in the future. Given the seminar’s success, we look forward to hosting similar events in the future.